Maybe, at long last some semblance of “justice” will be handed out to one of the group of “too big to fail” institutions, as a result of their “alleged” disregard for entities other than their own corporation. Although, given the damage they and other Commercial and Investment Banks have caused to America and its citizens, it hardly seems fitting that AG McKenna is only asking $2,000 per violation, of which there are “alleged” to be thousands. I’ll be very interested in seeing what the actual disposition of this suit and you can be very sure I’ll report on it, assuming I’m still around, when it eventually occurs. Interesting Article: Seems to repudiate the Growth Management Board’s dictums. SILVERDALE — Growth management acts haven’t worked and should be retooled, a leading Northwest economic analyst told local Realtors on Friday. Luis’ visit was funded by Washington Realtors. The acts, many of them around 20 years old now, were intended to concentrate density in urban centers, reducing sprawl and traffic congestion. But huge public investment in public transportation has brought only minor change in people’s driving habits in the past 20 years, he said. And homebuyer still prefer single-family detached homes, which translates into suburbs and cul-de-sacs and not increased densities in cities’ cores, he said. “The public has spoken pretty clearly that they want to be in single-family detached housing,” he said. Retooling growth management acts should include reducing lot sizes for single-family homes, he said, adding that builders have begun doing that, and buyers have not objected. Retooling also should include ways to make workers’ commute a half-hour or less. That means putting housing in the same subareas where people work. Revamps of growth management acts should have incentives to make communities energy efficient. 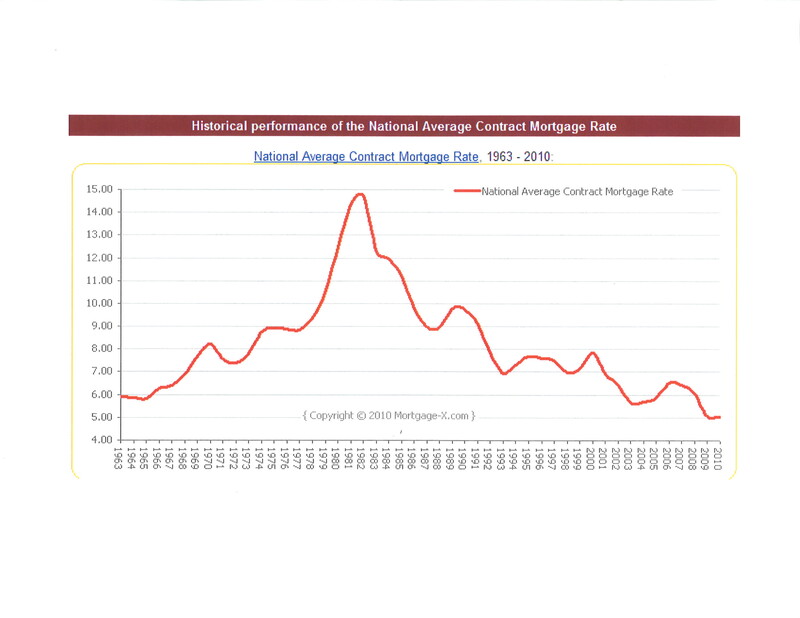 Luis predicted homebuyer will make that much more of a deciding factor than now. 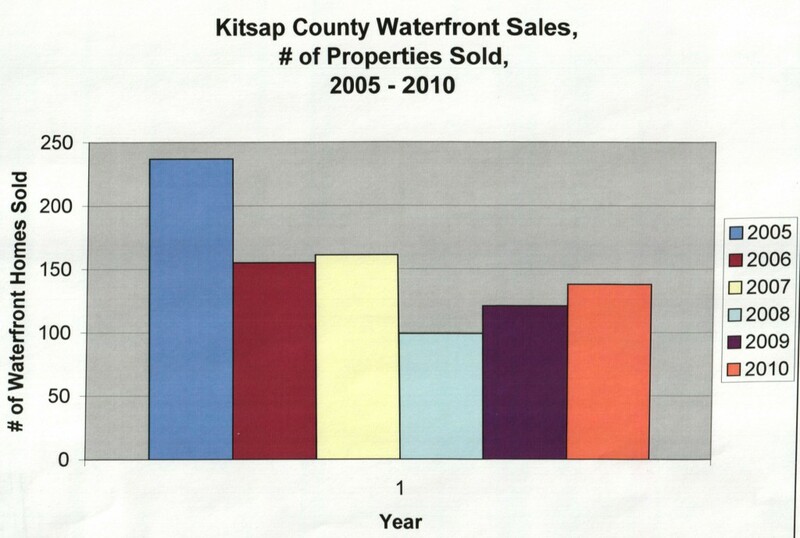 His listeners asked him why Kitsap home sales were still in the dumps even though mortgage rates are low and affordability is up. A lot has to do with Kitsap’s population, he explained. 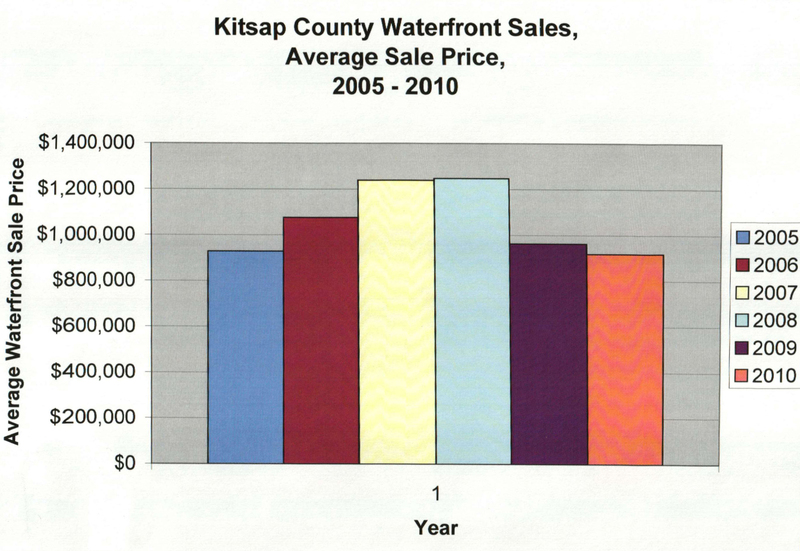 Kitsap’s population has tripled since 1960, but it has now leveled off, he said. Kitsap had 251,133 residents in 2010, according to the U.S. Census. Also, “People stopped moving here,” he said. He’s not sure why. Those who are moving here tend to be younger and not ready to buy houses. But they tend to be more highly educated, and in time will buy and be able to afford more substantial mortgages. The biggest chunk of new arrivals to Kitsap are from California. His audience agreed heartily when Luis said homeownership still is a good investment. A person who purchased a home for $100,000 in 2000 would have a $130,179 home today. That’s better than stuffing it under a mattress, where the $100,000 would be worth $76,923 today, or investing in the stock market, where it would be worth $69,935, he said. If you purchased your home before 2005 and are in for the long haul, chances are you’re still above water, he said. As I’ve mentioned in past posts, the news media seems to delight in broadcasting “dire” news to us these days, or maybe they always have and I just didn’t pay attention. In any event, they’re at it again: Last month I recall hearing about the potential for a “double dip” in the housing market, new home starts were down and prices took a substantial drop. In addition, job growth had slowed. Real Estate, like politics is local and that is supported by a report I read in Rick Newman’s reporting for US News. 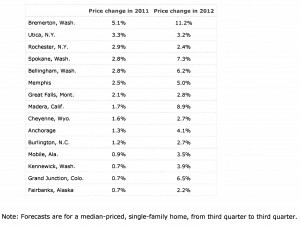 Case Schiller is projecting that Washington State will have 4 cities in the top 15 cities for the greatest housing market appreciation in 2011 and 2012 (See chart below). The Bremerton/Central Kitsap market heads that list at # 1 with a projected 5.1% and 11.2% projected appreciation for 2011 and 2012 respectively. At last, some good national news as well. While the Case Schiller housing value reports are projecting continued negative numbers for the greater Seattle area, the opposite is being projected for the close-by city of Bremerton. Rick Newman’s (usnews.com) post of 2/2/2011 reports that the research firm Fiserv (Case Schiller) expects four Washington towns to be in the list of the top 15 cities where home values rise in 2011. 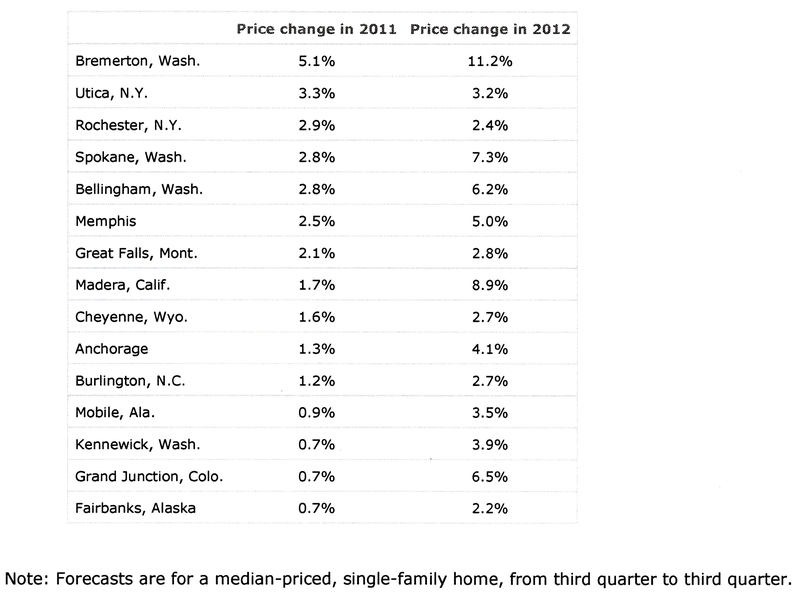 Bremerton tops the list of 15 with a projection of 5.1% for 2011 and an 11.2% increase in 2012. 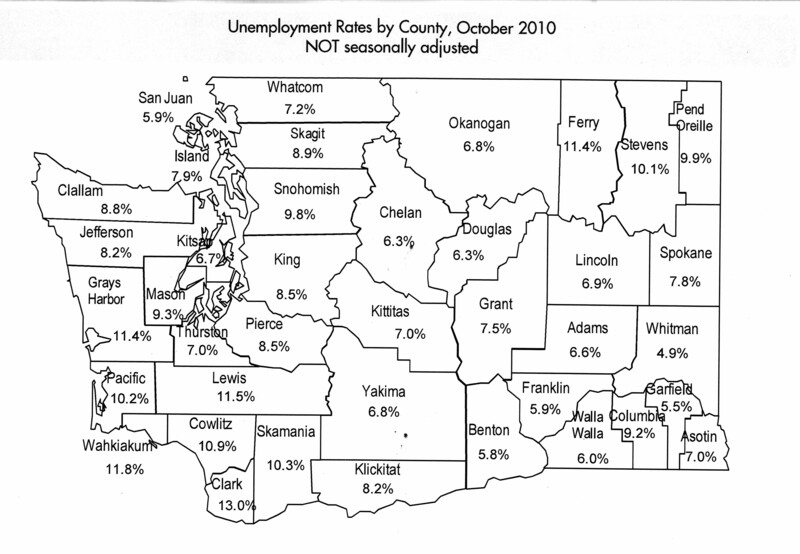 Similarly, but to a lesser degree, they are projecting 2.8% in 2011 for Spokane and Bellingham and 0.7% for Kennewick. In 2012, they are projecting 7.3%, 6.2% and 3.9% for these three cities respectively. I thought that this might interest (no pun intended) to some folks. 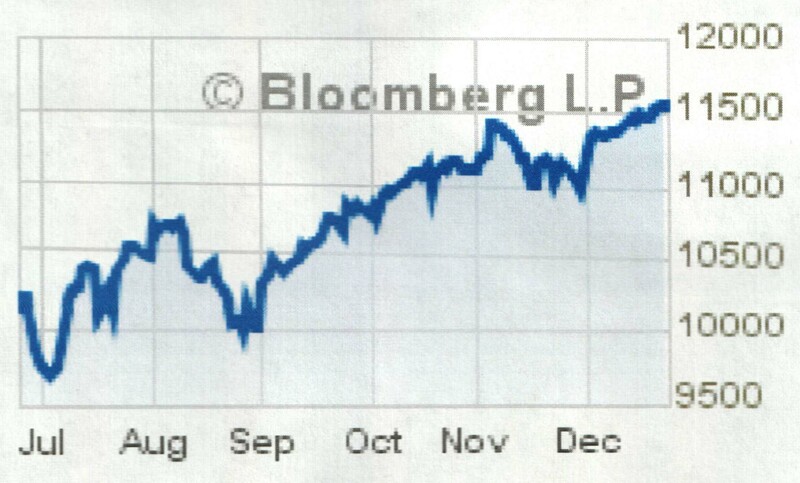 It’s amazing the swings that rates have taken over the years. Thank goodness they’ve stayed low through these tough times. According to Zillow, Poulsbo’s December 2010Â home values were Down 0.9% compared to November 2010 and down 6.7% compared to December 2009. 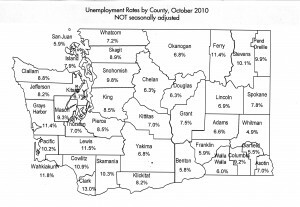 On the unemployment front, Washington State has an 8.5% rate whereas Kitsap County has a 6.7% rate compared to the 9.8% we’ve all heard about nationally (see below). The actual number of “distressed” properties, nationally, that sold in the third quarter actually went down 25% from the prior quarter. Likewise nationally, in the second quarter, foreclosure discounts were 26% vs 29% year over year. 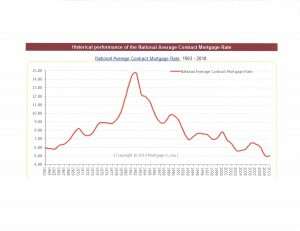 So hopefully this is a reflection of an improvement in the market more than an indication of price declines. more confidence in the public as well. With regard to waterfront County-wide, we again saw an average sale price decline, but dramatically less so than previously (-2.15% vs 2009 –see attached graph – Kitsap County Waterfront Sales). This results in waterfront’s overall value decline at almost 35% from its peak in 2008 to now, almost 33.5% of which came in 2009. There were, at the height of the selling season, over 250 waterfront homes on the market. On a more positive note, there have been 138 waterfront homes sold this year, with another 10+ under contract. 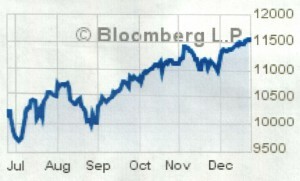 This exceeds the 99 and 121 sold in the preceding two years, respectively.